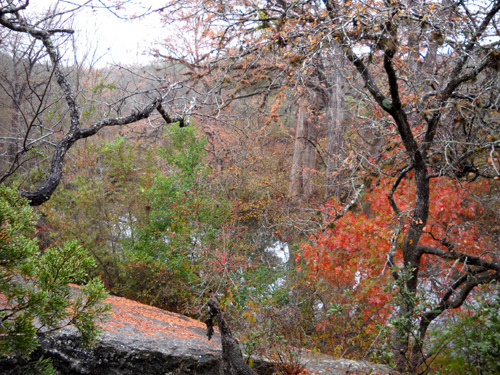 McKinney Falls State Park in Austin, TX is a nice place to wander, with minimal chance of getting lost even though the trails are spread out over 744 acres. 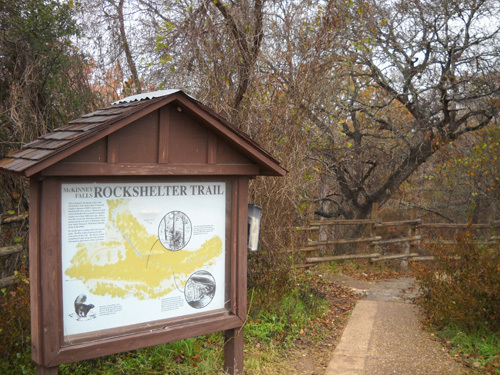 Visitors can pick up maps at the entrance gate/office and the visitors' center, and signage is pretty good on the trails themselves. 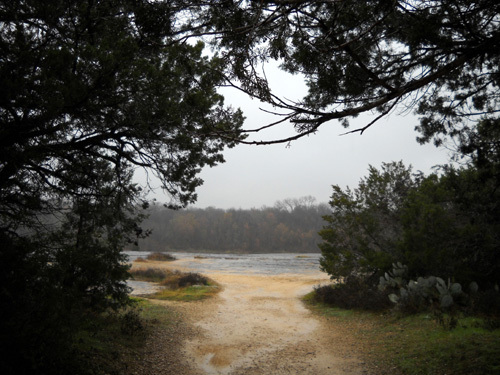 About six miles of the trails at McKinney Falls State Park are open to both foot and bicycle traffic, as are several miles of paved roadways and dirt service roads. 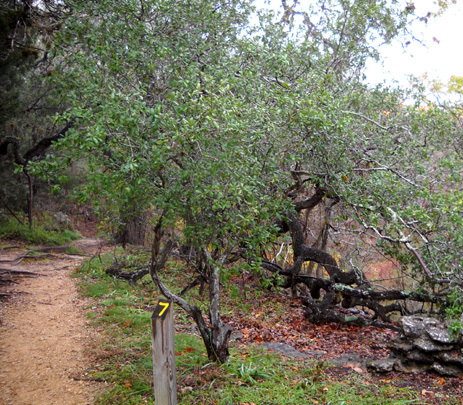 A couple miles of trail are for hiking/running only. 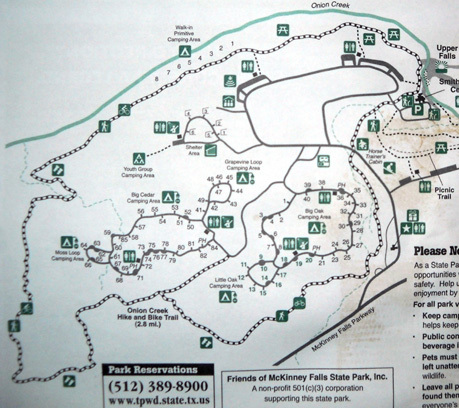 This map shows the major roads and trails through the park. 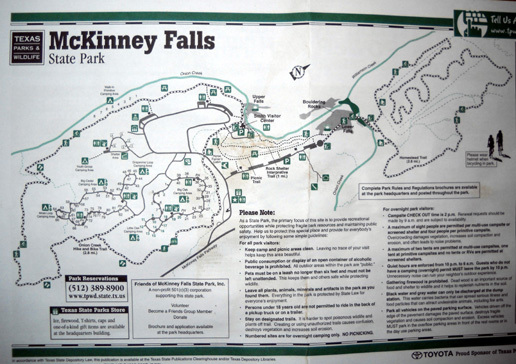 You can see this map more clearly on the Texas States Park website. 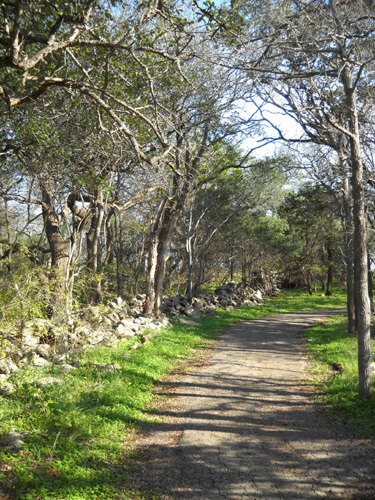 The campgrounds and Onion Creek Trail loop are on the left (south side of park). 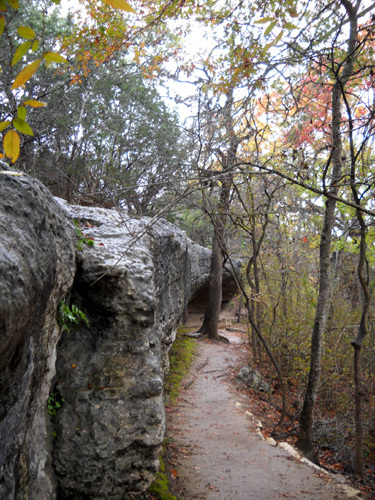 The visitor center and Rock Shelter Interpretive Trail are in the middle. 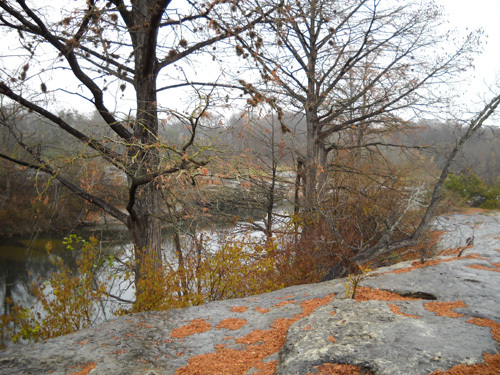 The Lower Falls and Homestead Trail are on the right (north end of park). 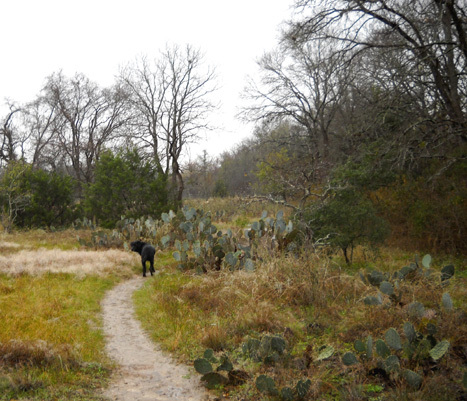 Jim and I would soon get bored with the relative paucity of trails here if we wanted to run big miles. However, because Jim's just recovering from plantar faciitis and I haven't been running or walking more than a couple hours at a time since getting my knee injections, we are satisfied with the trails we've found here. 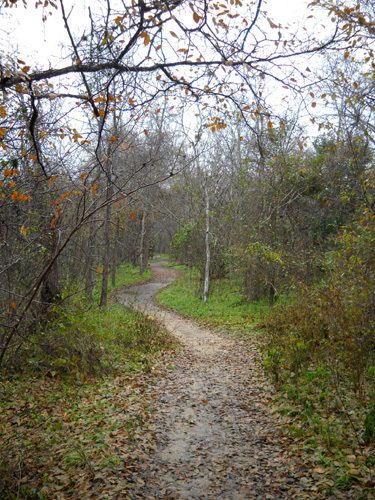 And there are plenty of other trails in and near the city to run. 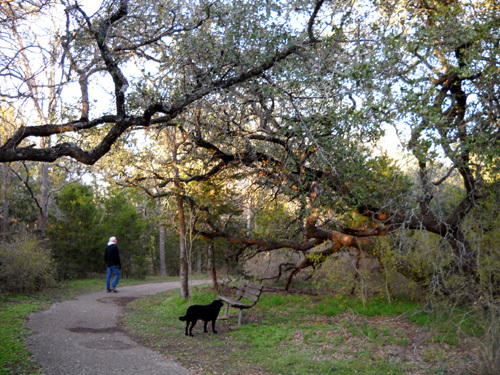 I planned to ride my road bike and Jim's trail bike at McKinney but that hasn't happened yet. So far we've either been busy doing other things or it's been too wet. I don't mind running and walking in the rain but I dislike cycling in it. 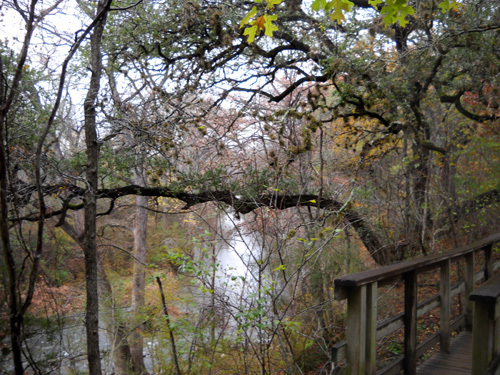 In this entry I'll describe the trails in the park and show pictures of the ones we've run or walked. 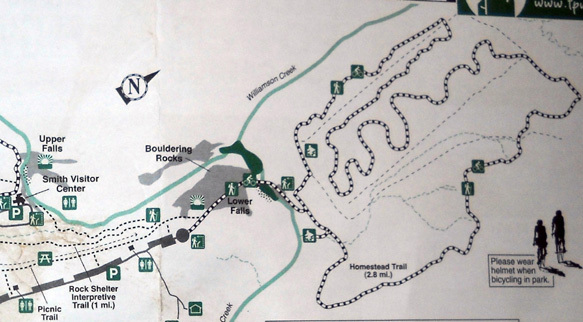 We've both gone out on 3-6 mile runs/walks several times on the Onion Creek Trail that encircles the southern half of the park (diagram below). 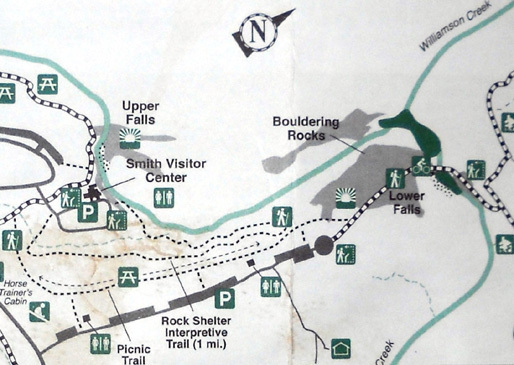 It's easy to add distance to the basic loop trail by using connector trails or adding other trails or roads to it. Believe me, if it was "steep," my knees would know. It is not steep. Cyclists going clockwise are advised to walk their bikes down this blind curve, not so much for their own safety as for the safety of oncoming pedestrians who might get wiped out. This trail is more interesting than it sounds. I hope these photos show its beauty. 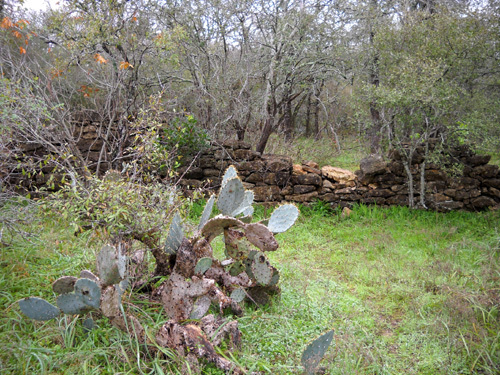 I showed more photos of cacti growing in McKinney Falls Park in the December 4 entry. 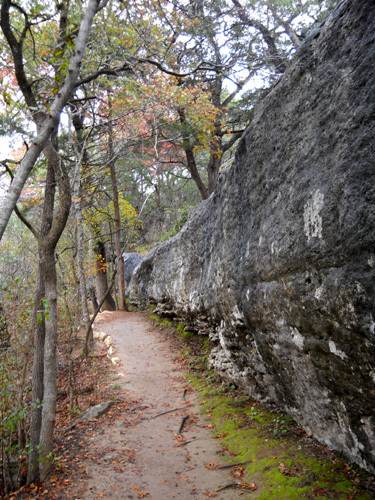 To me, the most interesting part of the Onion Creek Trail runs between the the creek and the rock ledges on the west side of the loop. 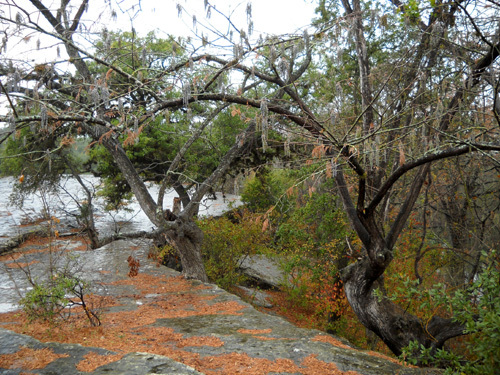 There are many small overhangs and caves in the cliffs that may have provided shelter to ancient hunter-gatherer peoples who lived in the area hundreds or thousands of years ago. Renegade paths leading up to them indicate they are popular with current visitors, too. 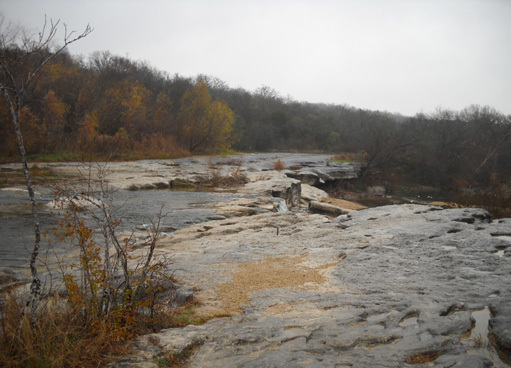 The Onion Creek loop also passes walk-in tent camping sites and picnic tables for a quarter mile along the creek and goes right by the Upper Falls and visitors' center. 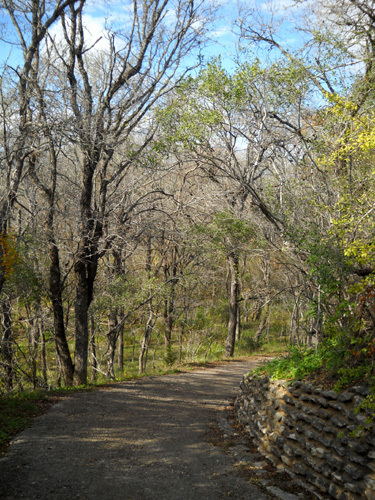 We are able to get on the trail near our campsite at the far left side of the loop; folks who are just there for the day usually access it from one of the parking areas near the visitors' center. You can go either direction on the loop. We haven't seen any one-way trails here. 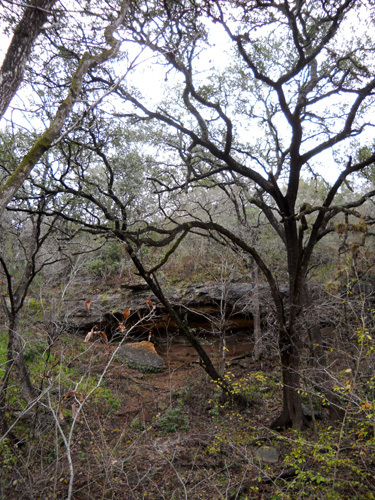 The part I like best follows the rocky hillside about thirty feet above Onion Creek and runs right through the largest rock shelter in the park. 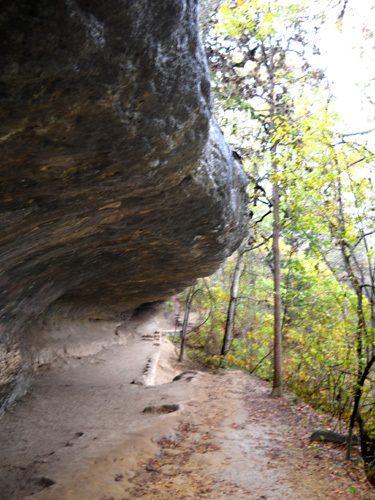 I showed several photos of the rock shelter in the last entry. the oldest bald cypress in the park. 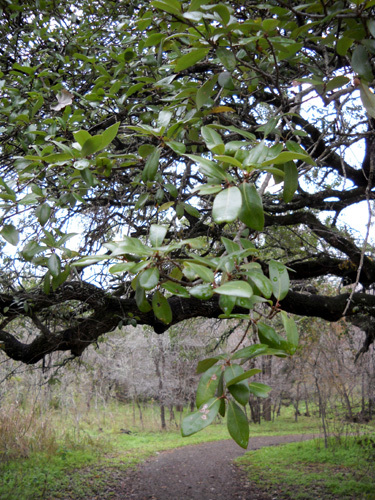 It is over 500 years old and 60+ feet tall. 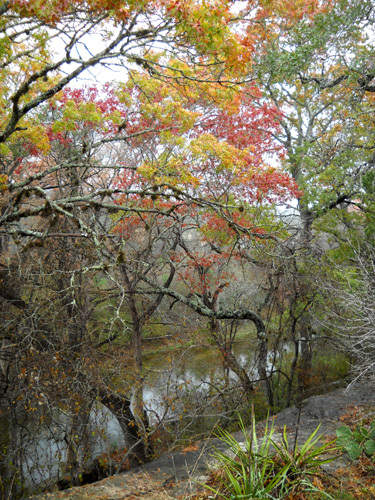 There are many colorful shrubs and trees along this trail in early December. 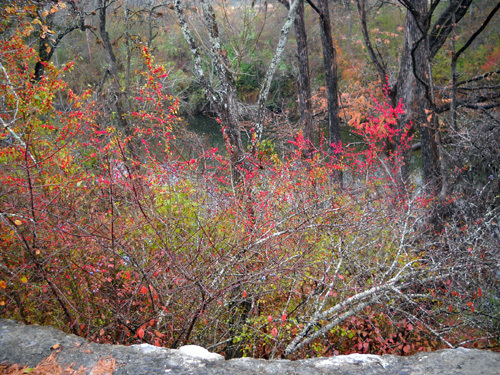 Most of the red in this photo is berries, not leaves. 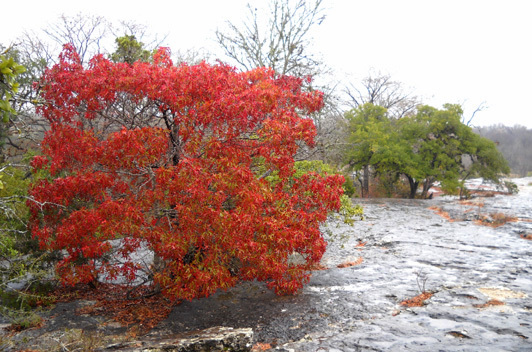 I stopped dead in my tracks when I saw this brilliant red tree! That's no PhotoShop trick. The numbers correspond to descriptions in a pamphlet originally created by a local teenager for an Eagle Scout project. 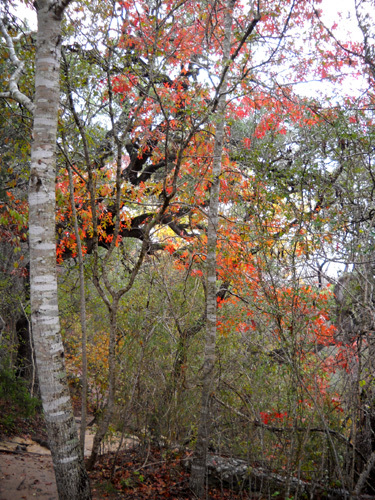 enters the woods again, and ends back at the visitors' center. 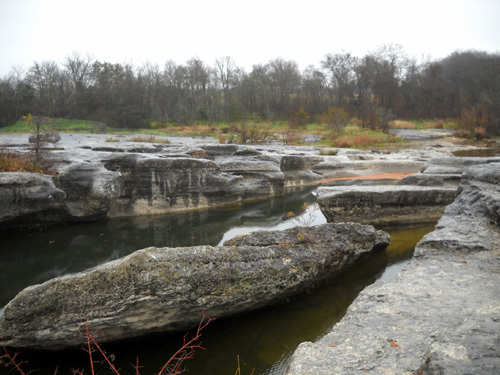 It covers a lot of interesting territory in less than two miles. 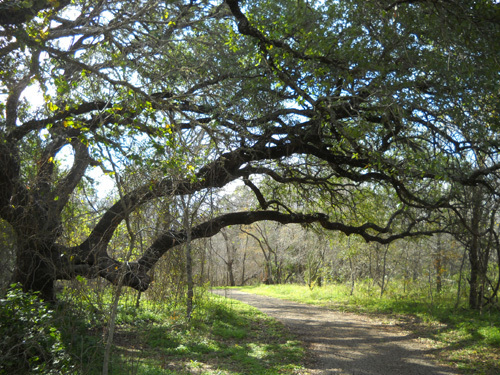 The Homestead Trail is described by park rangers as narrow single track dirt trail that is rougher than the park's other trails. 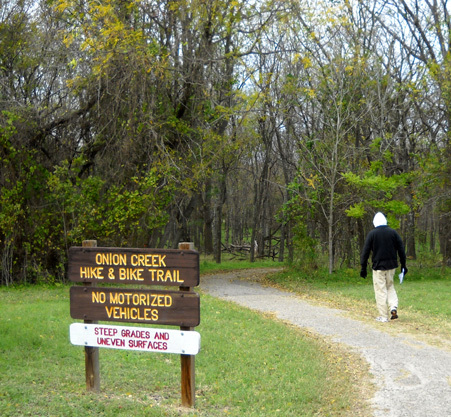 It is open to cyclists and hikers/runners. There are also some service roads that can be used in this area for additional mileage. 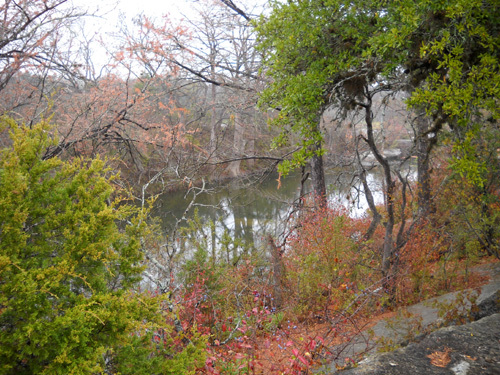 Park personnel can access the area from the nearby state park headquarters but visitors can get there only by fording Onion Creek from the south. 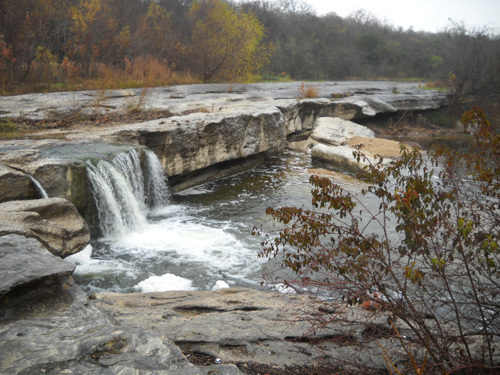 The Homestead Trail is accessed by fording Onion Creek above or below these falls. 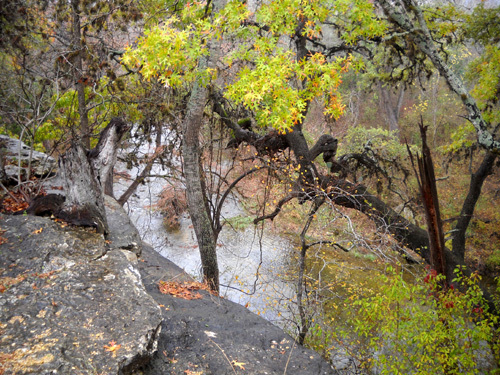 As much curiosity as I had about seeing the trails on the north side of the creek and the old McKinney homestead (remains of large home and grist mill), Onion Creek has been running too high and fast while we've been at the park to risk wading through it. 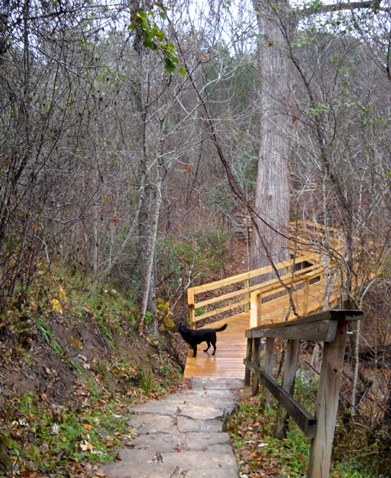 We'll probably have to save the Homestead Trail for another visit to the park.